As the decades old plan to bring Yangtze River water 1,400 kilometers north to Beijing and neighboring areas nears completion, people living along the south-to-north water diversion project are reflecting on changes brought forth by the historic program. When the project first started, Ye Mingcheng, a 58-year-old fish farmer from south China’s Hubei Province, had mixed feelings about the Danjiangkou Dam. His reluctance is understandable. The starting point of the south-to-north water diversion project, the Danjiangkou Dam began construction in 1958 following Chairman Mao’s decision to divert water from the south to quench the dry north. When the dam was completed in 1968, Ye’s ancestral home in Junxian County was completely submerged in water and has remained that way ever since. A teenager at the time, he couldn’t understand why his parents were crying as they moved to another county. For financial and technical reasons, however, the south-to-north water diversion project didn’t start following completion of the dam. Five years later, Ye’s family returned, settling down in a different section of Danjiangkou city and starting from scratch. Ye’s father died in 1985. “He was happy to be buried in his hometown,” said Ye. With reform and opening-up, Ye’s life improved. He built a big house, and earned nearly 200,000 yuan (about 33,000 U.S. dollars) a year from fish farming. Bad news came in the 1990s. The south-to-north water diversion project had officially started. Ye was relocated again in 2009, away from his father’s grave. Now, he is wondering what to do with his net, cages and fish, which are worth 3.5 million yuan. Ye is not the only one who made sacrifices for the project. To ensure the water quality, many of the residents surrounding the project had to find new careers, like 61-year-old Xin Xiyu. Two years ago, Xin, a farmer in Danjiangkou city, gave Li Keqiang, then vice premier in China, a bottle of water from the reservoir during a reception in Beijing. As a representative of local people, she promised to let Beijingers drink clean water. Xin’s family lived near a barren hill. The woman couldn’t remember how many times she cried for not being able to plant on the hill. When she finally put forth a plan to plant walnut trees, she was told that fertilizer and pesticide would pollute the water, which would be supplied to Beijing. Now she is promoting this technique among villagers. “To ensure the water quality is our common undertaking,” she said. Fan Zhihui, vice director of the environmental protection section of the Office of the South-to-North Water Diversion Project Commission (SNWDPC) of the State Council, noted that about 15 million people lived in the 95,000-square-kilometer area at the junction of Hubei, Henan and Shaanxi provinces, which was considered source of the water to Beijing. Between 2009 and 2012, more than 340,000 people have moved away from their homes and more than 2,000 factories closed, said Zhang Jiyao, director of SNWDPC. “Among the 43 counties in Hubei and Henan affected by the project, 34 are impoverished ones,” he said. The decision to move people away from their homes and livelihood’s was often the most difficult to make, Zhang said. To make up for Ye’s loss, the local government gave him a two-story building after he moved out of his old residence. He also received compensation for the 120 net cages, with each worth of 1,000 to 1,800 yuan. He is now trying to sell his remaining 130,000 kilograms of fish. Xin Xiyu was offered a compensation of about 250,000 yuan for her farm, and 100,000 yuan subsidy for building the bio-gas tanks. To ensure continuing water quality, four labs and 13 automatic monitoring stations were built along the project. Inspectors have set up 28 monitoring stations at the junctions of different cities and sensitive areas. More than 200 sluice gates were installed so that in case of pollution people could prevent the pollutants from spreading, said Fan Zhihui. However, experts still see hidden troubles along the way. For instance, the project runs past more than 1,000 bridges. 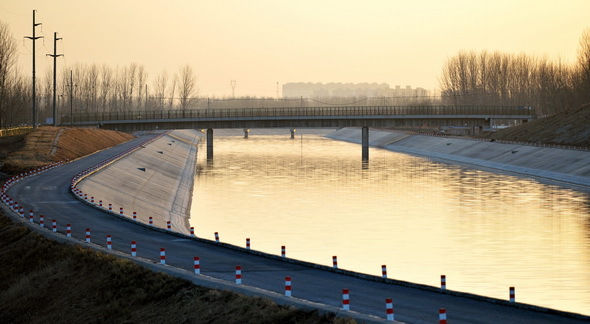 “If pollutants fall into the water from passing vehicles, we could shut the sluice gate, but then how to clean the water without contaminating local environment?” said Xu Xinyi, head of the College of Water Sciences under the Beijing Normal University. Another problem is the lack of a proper sewage plant. In Shiyan city of Hubei which Danjiangkou belongs to, 90 percent of the townships and villages cannot provide enough funding for sewage plants. They also have troubles attracting the right talent to do the job. As result, Li Zhonglan, 70, told Xinhua that in the Langhe town where she lives, a river was coated by algae. “It stinks when the sun comes out,” she said. Shiyan has planned to invite big enterprises to take over these plants. 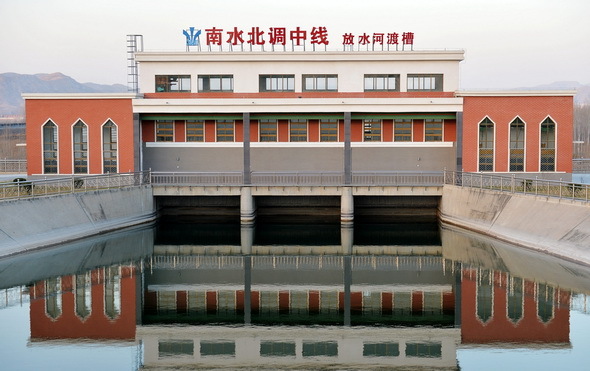 “It is our hope that the enterprises could help upgrade the sewage plants, so as to improve water quality,” said Zhang Binshen, head of the Xijiadian sewage plant. Authorities at the central and local levels began investigating a pollution case in which an aluminum manufacturer is believed to have caused environmental damage in central China. Environmental officials will probe into the contamination scandal in which Chuangyuan Aluminum Co. Ltd was accused of discharging untreated waste, allegedly imposing health threats and causing crops to wither in Taoyuan County, Hunan Province, the local government said on Sunday of December 7. The case was exposed via social media by the Beijing News on Saturday of December 6, in which the newspaper suggested more than ten people have developed cancer due to the fluoride from company’s aluminum processing projects. Pictures posted online show red-colored water seeping through solid waste. The polluted water then flows into the Yuanjiang River, a local waterway. Oranges grown in surrounding areas were also affected, with some fruits appearing in strangely green colors. The enterprise failed to follow environmental requirements in the construction of a landfill to dispose electrolytic aluminum, said the statement. The county government said it will ramp up supervision for Chuangyuan and help residents in the area to relocate as soon as possible. “More than ten people have died of cancer, and many villagers in the lower reaches of the river suffer from unknown pains,” a villager was quoted as saying. Chuangyuan was established in Taoyuan in October 2001. The company’s first production line was launched in April 2003. 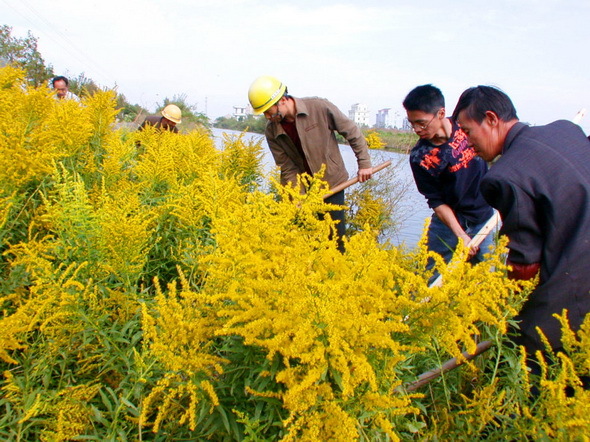 Chinese botanists have found that 515 invasive plant species have taken up residence in the country, covering both inland and coastal areas. The species, more than half of which are native to South and North America, are seen in all of China’s provincial-level regions and even in national nature reserves, Chen Xiaoya, director of Shanghai Chenshan Plant Science Research Center under the Chinese Academy of Sciences, told Xinhua on Sunday of November 30. Chen’s team, along with scholars from seven other institutions, spent three years researching the number and distribution of invasive plant species in the vast country. According to the researchers, Yunnan Province in the country’s southwest registers the most: 334 species, and the country’s southeast coast has 108. About 40 percent of the species belong to the families of sunflowers, legumes and grasses. The alien plants threaten their local counterparts. 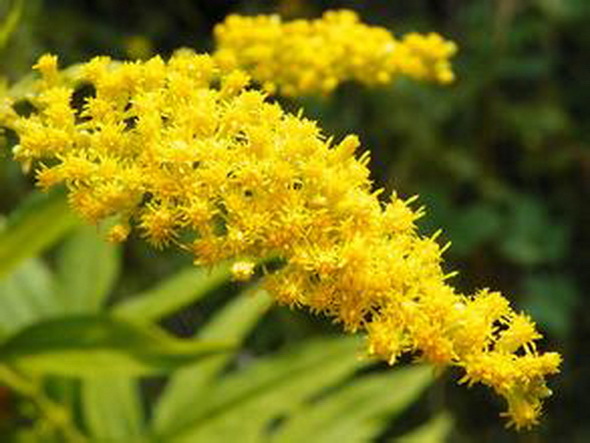 For example, Solidago Canadensis, also known as Canadian goldenrod (加拿大一枝黄花）, was introduced to east China in the 1930s as an ornamental plant and, in Shanghai alone, it has led to the elimination of over local 30 species. Previous studies showed that among the 100 worst invasive alien species identified by the International Union for Conservation of Nature, 50 have been brought to China. 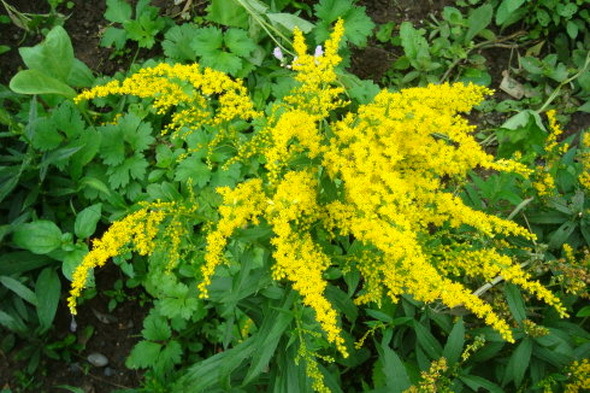 In mid-November, the Ministry of Science and Technology launched a project to create a data base of invasive plants. Nearly 30 researchers are expected to detail the species’ history, distribution and dangers in China within four years. Smog-prone Beijing will adopt a special air pollution control plan for next month’s APEC meetings, which features temporary closure of factories in the event of a pollution warning, local authorities said on Tuesday of October 14. Enterprises and coal-consuming furnaces on the capital’s black list of polluters will be ordered to suspend operations or reduce production to cut emissions during the meetings, Li Lixin, an air pollution treatment official with the Beijing Environmental Protection Bureau, told Xinhua on Tuesday. The plan also includes mandatory construction site closures. In the worst-case situation, neighboring Tianjin Municipality and Hebei Province will join in the emergency actions under a mechanism the three regions established to fight worsening air pollution last year, said Li. Some steel mills in Hebei, China’s largest steel producer, said they have received notice from authorities asking them to reduce or suspend production during the meetings to be held in early November. Beijing has tightened air pollution controls this year with more severe punishment for violations. The capital has handled 1,149 air pollution-related cases from January to September with total fines of more than 25.78 million yuan (4.2 million U.S. dollars), said Zhong Chonglei, chief of the Beijing Environmental Monitoring Team. The number of cases has increased more than 74 percent and the fines have doubled, according to Zhong. “Violators have to pay a much higher price than before,” said Zhong. Although air quality in the 13 most polluted cities in the Beijing-Tianjin-Hebei region has reportedly improved in the first nine months compared to the same period last year, with levels of sulfur dioxide and PM 2.5 dropping, worries over pollution remain following three days of smog beginning Oct. 8 in Beijing. Li said that air quality updates will be issued and sent to the public quickly if air quality worsens. If the air quality index is expected to top 200 for three consecutive days, an orange alert, the second-highest in China’s four-level warning system, will be issued, but the city will put into place pollution control measures usually called for under a red alert, the highest level. Such measures include banning the use of 70 percent of government vehicles and restricting the use of private vehicles based on even- and odd-numbered license plates, among others. Beijing has yet to issue a red alert for air pollution since the emergency plan was put into effect last November. APEC, short for Asia Pacific Economic Cooperation, is a summit for leaders of its members to discuss economic development of the Asia-Pacific region. The 21 APEC members, including the United States, China, Japan and Russia, account for over half of the world’s economic output, 40 percent of the world’s population, and 46 percent of the total global trade. The APEC Economic Leaders’ Meeting will be held in Beijing from Nov. 10 to 11. During the APEC leaders’ week, China will host a series of meetings, including the final senior officials’ meeting from Nov. 5 to 6, the 26th ministerial meeting from Nov. 7 to 8, the 22nd APEC Economic Leaders’ Meeting from Nov. 10 to 11, as well as the APEC business and leader spouses’ events. 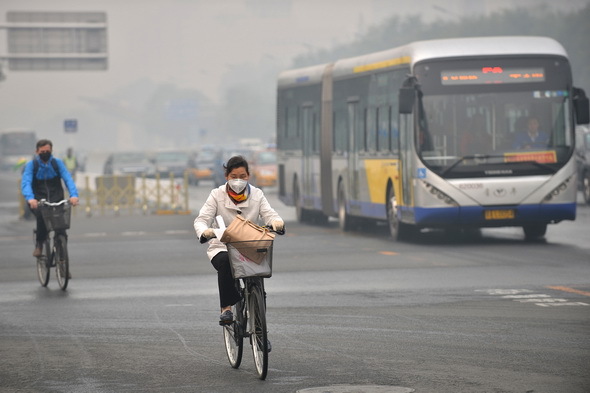 A woman wearing mask rides on smog-shrouded road in Beijing on October 10, 2014. Photo taken on October 11, 2014 shows the smog-shrouded buildings in Beijing. 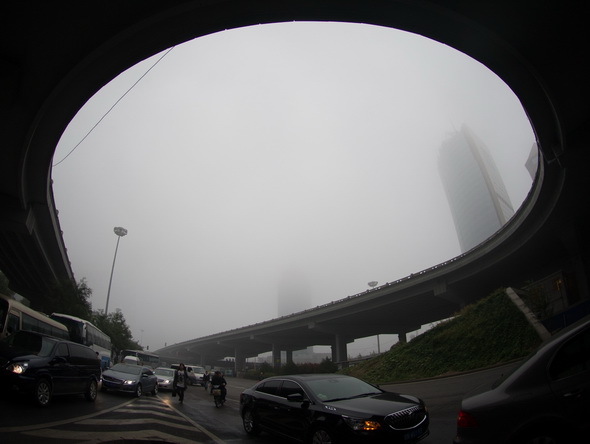 The dense haze continued in Beijing and neighboring areas for a third day on Friday of October 10 with a yellow alert remaining in effect. The first bout of heavy smog this autumn has forced authorities in Beijing and Hebei Province to cut industrial production and suspend construction work. 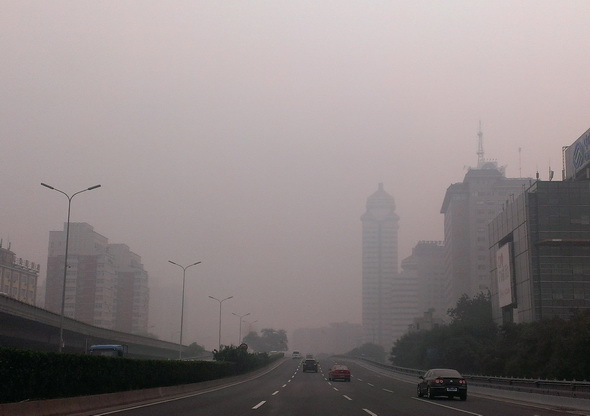 Tianjin Municipality and Henan Province have also issued haze alerts. Thirty-five companies have halted production and 74 others reduced emissions by 30 percent in the capital, said the Beijing Municipal Commission of Economy and Information Technology on Friday of October 10. The air quality index (AQI) for Xingtai City in Hebei was 500 on Friday morning, making it the worst polluted city, again. Xingtai, an industrial city 400 km south to Beijing with heavy industries such as coking, glass and steel,just shook off the title of the country’s worst polluted city in July and August. Within a 25-km radius of downtown Xingtai, there are 133 plants in iron and steel, cement, glass and power, etc. which consume 16 million tonnes of coal per year. Local officials call the polluting firms the “black necklace” of the city. “We feel huge pressure to reduce pollution,”said Xu Huailiang, deputy head and chief engineer of Xingtai Environmental Protection Bureau. Xu, who has worked in the bureau for 30 years, says he feels ashamed whenever people talk about Xingtai as the country’s worst polluted area. The city is taking action. This year, it has cut iron and steel capacity by 1.85 million tonnes and coking capacity by 1 million tonnes. By 2017, the city will have cut a total of 5 million tonnes from iron and steel capacity. Sept. 30 was set as the deadline more than 2,000 companies in the city to discharge pollutants in line with environmental protection requirements or be closed down. “The pollution situation is grave, but we have a firm resolve to deal with it,” said Xu, adding environmental officials are checking whether companies have met the targets. The Beijing, Tianjin and Hebei region has been listed as the worst polluted region by the top environmental watchdog. Coal burning, vehicle exhausts and dust are among the major pollutants. In February, the coordinated development of the region became a national strategy, with the joint treatment of air pollution as one of the main purposes. 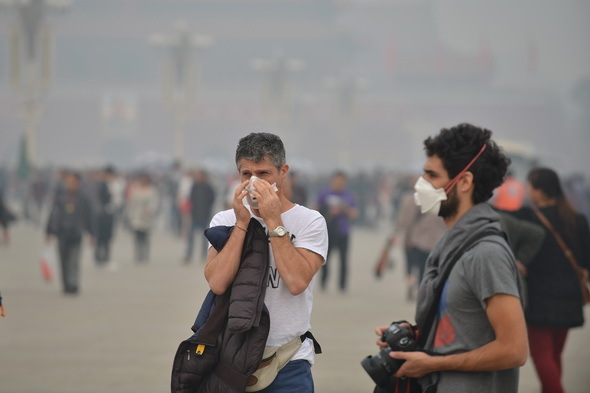 “The haze in the region in recent years, is not only a problem for the region itself, but one related to all northern and eastern regions,” said Zhang Gui, deputy director for Beijing-Tianjin-Hebei Development Center at Hebei University of Technology. “The pollution is a result of a growth model featuring high energy consumption and emissions. It must be solved on a regional level,” said Zhang. Results of pollution control in the region are already felt. Take Xingtai City. The city has seen 66 days with good or fairly good air quality this year, 28 days more than the whole of last year. Beijing and neighbors regularly coordinate on pollution, but they need to improve their information sharing and consultation on alerts and response, said Li Lixin, an official with the Beijing Environmental Protection Bureau. “In terms of joint regional pollution control, each city or province should first deal with its own problems and then shoulder common responsibilities,” said Feng Yinchang, a professor in environmental science and engineering at Nankai University in Tianjin. “A simple transfer of pollution should be avoided,” Feng stressed. Beijing is considering moving some companies to Tianjin and Hebei as it transfers some of its non-capital functions. China plans a monitoring and warning system to respond to heavy air pollution with more attention given to pollution control in coal burning, vehicles and dust in key regions, according to a revised draft of the Air Pollution Law unveiled in early September. More strict law enforcement is expected. Despite slight improvements in air quality in the Beijing, Tianjin and Hebei region this year, days of heavy pollution will come again, said Feng. “It will take a long time for us to realize the ideal blue sky days because the pollution problem will not be solved in three or five years,” said Feng.